This group is designed to enable innovation, share best practices and educate QlikView users in the Financial Services industry. This allows a user to directly compare the data for 2 different dimension values side-by-side. Of course this capability exists in our sister product QlikView, but it's great to have it now in Qlik Sense. Watch this space for further updates and new Insurance Apps this year. We use Qlikview since V10 and upgraded it to Version 11 and in due Course the upgrade to V12 will follow. Since V10 we tested with Windows 10 and the diffrent Office versions (now Office V16) the Drag&Drop functionality of Charts in our Qlik Reports into PowerPoint but were unable to get it done. There is a green shadow on the selected Chart but then no further step is possible. The Export of the data's into an Excel sheet works but not the Chart. What could be the reasons? We asked during the update of V11 developpers in the UK which could not help us during a webconference. Finance and Accounting use cases are taking off (both in Financial Services and all other industries) at Qlik. Finally, the original post on Qlik Community had over 13K views Finance Toolkit‌ so it was clear to me that posting my most recent version would be valuable. As time has gone by since the original post on Qlik Community, I have worked with customers, partners and other Qlik employees to overhaul and modernize with the latest and greatest. Thanks to all involved, it has been a team effort! More to come on this in the form of videos & blogs but wanted to use this forum to announce that the new version has been posted on the demo site. Enjoy and share this with your Finance, Accounting and Audit co-workers! 3. to re-run the script, you need to get a free key from barchart.com. Then go into the script and past your API Key on line 62. That should do it, you now have access to the Qlik Sense Stock Price Technical Analysis. Would love for people to add additional analysis to this and post it back. one of my requirement says to bring a new field into the existing table . but i see difference in the facilityID's, i want to get all the facility Id's data, can anyone suggest me how to do that? and how this approach expands the potential use cases for Business Discovery, enabling business users to conduct associative analysis on larger data sources. We at Bardess Group Ltd. became very excited about the possibilities of applying this approach to FDIC Summary of Deposits data that we had modeled a few years ago, and running that data through Alteryx to go even deeper with our analyses. 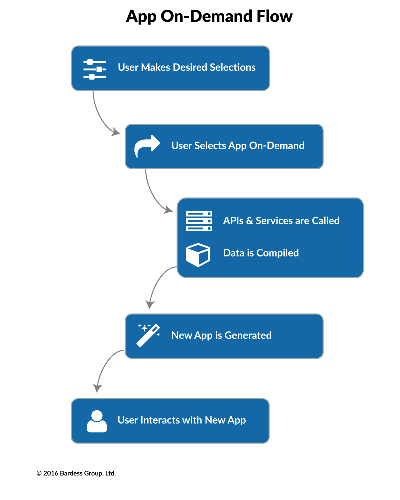 We have developed a custom "app on demand" extension that can be configured to send data through other data engines, read the output back into Qlik Sense, and load the enhanced data set into a new application for focused analysis. We happen to think it's pretty great, and invite you to try it yourself. We also just posted the extension to Qlik Branch‌. Thanks to Ian Crosland , Paul Van Siclen and others at Qlik for collaborating. This utility reads in QlikView Server session logs from a user configured windows folder. The dashboard shows # sessions, # distinct users, peak concurrent sessions, cumulative duration of sessions and a session:user ratio. The utility can be used to analyze peak concurrency events, solution adoption, most active users (and candidates for Named Cals), and it drills down to individual session details (sessions tab). Use the trend chart on the concurrency tab to drill down to the minute level of detail ! Hope you find it handy and feel free to send me your suggestions. i just ran some analytics on the number of views of this group and am impressed with the number of people utilizing this resource. We will strive to continue to post and keep you updated on industry related content. Feel free to post your comments on this discussion thread! With increasing regulatory obligations and potential for litigation aimed at the Financial Services industry over recent years, Master Data Management (MDM) has become a hot topic for most (if not all) firms in this sphere. Here we demonstrate our Qlik Sense driven solution to managing some of the most frequently encountered MDM issues. The core principle of the MDM process concerns referencing source data against master records and resolving any exceptions. This can be achieved in numerous ways but one of the most exciting and innovative solutions involves the use of blockchain technology. A private blockchain will improve data governance and create a fully transparent MDM workflow for all parties involved. The blockchain contains a set of pre-defined rules that act as the gatekeeper of data quality, regulating the way in which data is mapped to existing records, and governing the conditions that allow the creation of new records. Our demo app is based on a Transactional FX Business and provides a method for appraising Master Data Management performance as well as a route to improving MDM processes. In this app, we focus on data steward performance from a product and client master data perspective. Check out our demo video attached. If the situations described sound all too familiar, and you are looking for a rapidly deployable, versatile and effective solution to your MDM challenges, we would love to hear from you. Our website is pomerolpartners.com. We are looking to recruit an information analyst to assist in developing and maintaining our BI applications, alongside ad hoc data and programming projects for our other information systems. The successful candidate will join a small, close-knit team with a strong collegiate culture. Majedie’s information team is very much integrated within the wider business, and so the ability to communicate with colleagues across all levels is important. This is a full-time, permanent role based in London - candidates must have a UK work permit. We are looking to fill this position as soon as possible. This is a permanent full-time role based in the UK. Majedie Asset Management, established in 2002, is an independent investment boutique that actively manages equities for institutional investors, wealth managers and endowments across a range of UK and Global strategies. Majedie was founded by a team from Mercury Asset Management with a clear aim: simply to make money for our clients. We are proud of our distinctive, long-term track record - but remain as hungry to perform today as we were on day one. Importantly, every Majedie employee owns equity in the business; we are in partnership with our clients and here to stay. Similarly, our fund managers all invest in Majedie funds, further aligning our interests with those of our clients. We view our capacity as scarce; we believe investment performance suffers from diseconomies of scale if assets under management grow too large. We are determined to maintain the size advantage for our clients and therefore limit the available capacity in each of our funds. Assets under management total approximately £11bn ($16bn). This demonstration is a quantitative risk analysis of a single project that demonstrates the speed of the Qlik engine and the ability to not only interact with the model but also drill through to the detailed model output. The model in this case is the "Total Profit Equation" and an analysis of the range of possible outcomes provided the model assumptions. General Motors (GM) uses simulation to estimate both the average return and the riskiness of new products. All interesting (and possible) and this particular model is simply a basic template to head down the path. Thanks to Brian (https://community.qlik.com/people/bbu‌) @bbu for building the baseline Monte Carlo Simulation in Qlik Sense. I have enhanced his great work and am posting here for the broader community. The current file is set at 1,000 simulations but feel free to move it to 100,000 to see how long it takes to run a larger model set. What about 1 million simulations? At Qonnections 2016 this year, Deloitte presented a model of a gold mine that forecasted a full balance sheet, income statement and cash flow of a gold mine with every variable being simulated. Further, it uses Qlik's powerful Time Value of Money functions to calculate the Net Present Value of Free Cash Flow generated by the model. I've a table which shows performance of stocks. In 1st column there's list of stocks and in the 2nd column performance of each of the stocks. Now is need to add a third column which represents the performance of the benchmark which is S&P500. The tricky part is when I add the third column for S&P 500 returns it needs to be static i.e. the return of S&P500 will be the same number repeated for each of the rows irrespective of the corresponding list of stocks in each of the rows. Please look at the attached image and kindly help if you can? 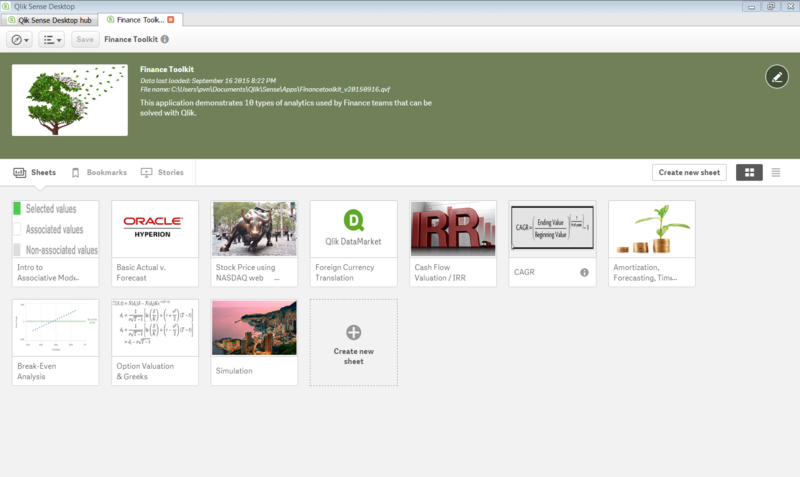 Qlik Sense v2.1 was recently released and this new version provides a method of creating/editing variables. With this new functionality, I decided to take a shot at consolidating some of the tools I have created into one killer Finance App. The app has been pretty popular so far so I added some additional functionality and am posting it here. This is a simple view of several list boxes which demonstrate the ability of the user to drive analysis through an unlimited combination of Divisions, Products, Cost Centers and Accounts. The source of this tab is an essbase extract. Note that a QlikView connector is available on our download site which can completely streamline this process and we have several customers who have successfully implemented this. I don't have a date when the Qlik Sense version of the connector will be available but you can copy the script from QlikView and paste it into Qlik Sense. Data captured from HTML tables provided by the Nasdaq site. You have the ability to type in any ticker and click on the Reload button to capture a different set of data. This is a dynamic IRR calculation on a population of 299 different investments. An unlimited combination of dimensions can be selected to see the IRR. The formula being used here is =rangexirr() which is a very powerful function for this purpose. I have used this to value a actual portfolio of earning assets in the past and it was very powerful. The =Rate() function calculates the Compound Annual Growth Rate of a portfolio. Data is made up of 2 divisions (Commercial and Consumer) and 30+ business units. The power of this analysis is that the CAGR formula is tied to the dates selected. For example, make a selection on the last 5 quarters and compare that portfolio CAGR to the previous periods. If you can create an accurate model for a single loan, then you can model an entire portfolio. This is a Single Loan Model which forecasts the AUM and Interest Income over the selected term of the loan. It is not a stretch to combine this with other data points/vintages and build a model for an entire portfolio. A simple formula applied to the "profit equation" displayed in a "Line" which is an important step to the next few tabs. Demonstrating the inputs related to the Black-Scholes model (which is a built in function of Qlik). The chart is simply demonstrating the impact of changing the volatility assumption on the price. The higher the volatility, the higher the value/price. The total profit equation with one of the variables (Price Per Unit) assigned to a normal distribution with a Standard Deviation assumption. This entire simulation is calculated in memory and becomes very interesting when you add a 0 to the # of simulations (1000; 10,000; 100,000 simulations all run very quickly on my laptop). Used in practice, you may consider putting this formula into the script, build a table, store the model in a qvd (with other scenario runs) and reload all of the data into memory. Demonstration of FX Conversion with currency data from Qlik DataMarket. The four .CSV files were downloaded and imported into Qlik Sense to develop the demo discussed in the video and the demo is attached to this post. Trended Yield/Interest Rate for total portfolio held on chart to compare to Trended Yield/Interest Rate for selected portfolio. Achieved through a differentiator call "Set Analysis"
Global Search across entire data set (for example, search on "60 months AZ 2014" for all 60 month term loans originated in Arizona, in 2014. Scatter diagram on second page provides some visibility into the pricing practices at the Lending Club. I want to create a continuous line chart with the output of the set analysis below. I believe i can do it with the AGGR function. I think the issue with my output is that I need the chart to ignore the Curve Date (always selected). Can someone help me change a resident load to a traditional load from the original QVD files? This is my resident load script. I'm trying to create a end of month total. When i changed the source of data from resident to qvd I got nothing??? Someone use it in the same area ? A leading bank used NPrinting to cut 400 hours per week from generating customized PowerPoint briefs. One insurance company used NPrinting to eliminate business objects for reporting saving over $100k/year. Another bank sends emails whenever G10 rate changes will impact their risk portfolio making their business operation more secure and less likely to show up on the front page of the journal. This community page contains a video describing how NPrinting is used in Financial Services - and builds a NPrinting report from scratch. We held and event with IPC Global (Qlik Global Partner of the Year) who has proven Qlik success in the US Banking industry. This is Customer Experience, Profitability, Big Data and Internet of Things addressed with Hadoop, AWS and Qlik. The analogy to banking and banking profits can be drawn with MANY lines.